While supplies last! Only one available at this price! This is the official limited edition Anniversary model, finished in a hand-crafted African Mahogany cabinet. Only 500 will be built. Your search for the Holy Grail of VOX tone ends here. 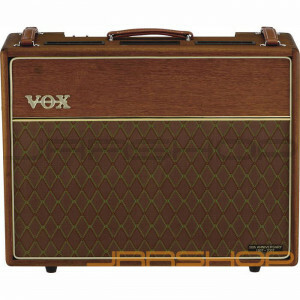 To commemorate the 50th Anniversary of VOX guitar amplifiers, we are pleased to introduce the latest in the new Heritage Collection range of hand-wired amplifiers – the AC30H2L. Rather than just a typical reissue where a vintage amp is dusted off and copied, this amplifier, like the others in the Heritage Collection, transports you through the golden age of VOX tone, combining the prized EF86 preamp channel of 1958 with the 1963 Top Boost channel all in one amplifier. Add in some modern tone shaping control enhancements and the result is perhaps the finest VOX amplifier in the company's 50 year history. Channel 1 is the EF86 Preamp channel, and features two inputs wired in the traditional way providing a 6dB gain difference between them. A two-position BASS SHIFT switch is included, with position 1 voiced to the original vintage-correct bass response and position 2 voiced to tighten the bass response and reduce any muddiness during high volume use. The three-position BRILLIANCE SWITCH provides flat response when in the OFF position. Position 1 is a new position voiced like the early "AC30 Treble" amps, while position 2 is the original brilliance circuit, which acts as a dramatic bass cut. The EF86 Mode switch re-configures the EF86 valve from Pentode mode to Triode mode. Triode mode will give a lower gain tone with higher headroom. Pentode mode is the famed original mode and has a very sweet high gain tone with less headroom. Channel 2 is the Top Boost Preamp channel. Like Channel 1, this channel includes two inputs wired with a 6dB gain difference between them. The Treble and Bass controls are from the 1963 Top Boost circuit and are extremely interactive. Very minor adjustments of these controls can yield dramatic changes in tone colour. And true to VOX form is the Top Cut control, which cuts high from either channel end as it's turned up. Flexible power. The O/P Switch adds even more flexibility to the AC30 Heritage. This switch changes the power output valves from Pentode Mode, which is the normal operating mode of the power amplifier, to Triode Mode which halves the power output to 15 watts and at the same time offering smoother tonal characteristics. The finishing touches. Housed in an oil finished, hand-crafted African Mahogany cabinet. This is the official limited edition Anniversary model, and only 500 will be built. Launched July 2007.